The 16 songs cover: verbs, nouns, sentences, pronouns, compound personal pronouns, adjectives, adverbs, apostrophes, prepositions, direct objects, capitalization, plurals, irregular verbs, commas, quotation marks and Greek & Latin prefixes and suffixes. From Audio Memory. 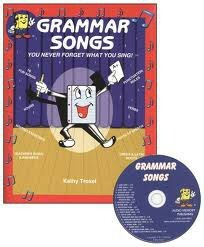 The Grammar Songs Kit teaches all the parts of speech (except conjunctions) and rules of punctuation and 72 Greek and Latin roots for building vocabulary. It is appropriate for grades 3 - 8 or for anyone who needs help with grammar (secretaries, ESL students, etc.). It includes a 72-page workbook with song lyrics, illustrations, drills and writing exercises; a Teacher's Guide and a long-playing sound track with 16 songs. The 16 songs cover: verbs, nouns, sentences, pronouns, compound personal pronouns, adjectives, adverbs, apostrophes, prepositions, direct objects, capitalization, plurals, irregular verbs, commas, quotation marks and Greek & Latin prefixes and suffixes. From Audio Memory.